Most Rev Archbishop William Goh Seng Chye is the fourth and current Archbishop of Singapore. Archbishop Goh succeed Archbishop Emeritus Nicholas Chia as Archbishop of Singapore on 18 May 2013. Archbishop Goh is the fourth and current Rector of St Francis Xavier Major Seminary in Singapore. Most Rev Goh was schooled at Montfort Junior and Secondary Schools, where he obtain an "A" Level Certificate. He completed his study in Philosophy at the Major Seminary (College General) in Penang, Malaysia, and did his theological studies in the Major Seminary in Singapore. Goh was in the first cohort of seminarians to graduate at the newly built St Francis Xavier Major Seminary in Ponggol, Singapore. After his graduation from the Major Seminary, he was posted to the Church of the Holy Cross where he served as an Assistant Priest to then Rev. Nicholas Chia (who later became Archbishop). In 1985, he received a Bachelor of Theology from the Pontifical Urbaniana University in Rome. Most Rev Goh continued his studies in Rome, receiving an Licentiate in Dogmatic Theology from the Pontifical Urbaniana University. 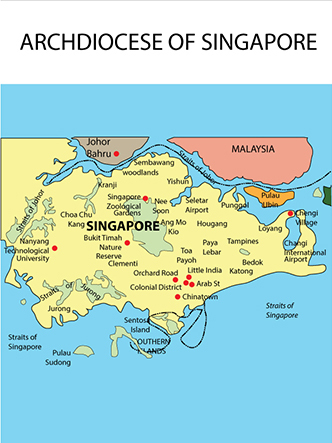 After returning to Singapore, he was posted as the Parish Priest of St Anne's Church while concurrently lecturing Systematic Theology at the Major Seminary. He was ordained as a priest on May 1, 1985 by the late Archbishop Gregory Yong at the Church of the Holy Family. In 1992, he was posted as a Resident Formator and Initiation Year Director at the Major Seminary. In 1995, Archbishop Goh became a member of the Theological Advisory Commission of the Federation of Asian Bishops' Conference. Whilst in the Major Seminary, he became Dean of Studies, then procurator and finally Rector of Major Seminary. Goh was the Spiritual Director of the Archdiocesan Catholic Spirituality Centre, Amplify Youth Ministry, Jesus Youth Singapore and the Catholic Charismatic Renewal Experience. Archbishop On December 29, 2012 the Vatican announced that Fr William Goh has been appointed as Coadjutor Archbishop of Singapore. He will be the second Singapore-born clergyman to hold the office of Archbishop. As Coadjuctor, he will assist the current Archbishop until he retires when he reaches 75. He was ordained as Coadjuctor Archbishop of Singapore on 22 February 2013. His principal consecrator was the Apostolic Nuncio to the Republic of Singapore, Archbishop Leopoldo Girelli and his Principal Co-Consecrators were Archbishop Nicholas Chia and Archbishop Murphy Pakiam. His consecration was attended by the President of the Republic of Singapore, Dr Tony Tan Keng Yam, Deputy Prime Minister Teo Chee Hean, Chief Justice of Singapore Sundaresh Menon, state dignitaries, twenty bishops, more than 170 priest and an estimated 14,000 Roman Catholics, together with representatives of the major religions in Singapore. He still serves as member of the Senate of Priests, member of the College of Consultors, ex-officio member of the Archdiocesan Vocation Team. On 18 May 2013, William Goh was officially installed as Archbishop of Singapore. A press release from his office stated that one of his first tasks was to “strengthen the fraternal bonds in the Presbyterium and harness the charisms and passion of his brother priests” so that they can empower the laity to be “co-responsible in the mission of the Church”. The newly installed Archbishop of Singapore also announced a new line-up of key office holders. The Cathedral of the Good Shepherd is the seat of Archbishop William Goh.